These Oatmeal Raisin Baked Oatmeal Singles put the flavors from my favorite cookie into a healthy, on-the-go breakfast! Sweet raisins and crunchy pecans (or walnuts) are the perfect complements to oatmeal and baking it into muffins is my favorite way to eat it. If you’ve never made one of my baked oatmeal singles before, what are you waiting for? I have a ton of varieties and they are super easy and fast to make using ingredients you probably have on hand. Plus, they make great leftovers and they are perfect to grab for a quick weekday breakfast. I know that “Oatmeal Raisin Baked Oatmeal Singles” contains the word oatmeal twice and is kind of a mouthful, but since they remind me of the cookies I can’t seem to title them any other way. Just give me this one and roll with it! Looking for more varieties of baked oatmeal singles? Try my Raspberry Peach Baked Oatmeal Singles, Orange Cranberry Baked Oatmeal Singles, Pear Gingerbread Baked Oatmeal Singles, Strawberry Banana Baked Oatmeal Singles, Blueberry Baked Oatmeal Singles, Banana Chocolate Chip Baked Oatmeal Singles, Carrot Cake Baked Oatmeal Singles, Apple Cinnamon Baked Oatmeal Singles, Pumpkin Chocolate Baked Oatmeal Singles, Chocolate Cherry Baked Oatmeal Singles, Pumpkin, Cranberry & Apple Baked Oatmeal or Blueberry Peach Baked Oatmeal! Combine the oats, brown sugar, baking powder, salt and cinnamon in a large bowl and stir until thoroughly mixed. In a separate bowl, whisk together the egg white, egg, milk, applesauce and vanilla. Add the wet ingredients to the dry ingredients and stir until blended together. Stir in the raisins and nuts. 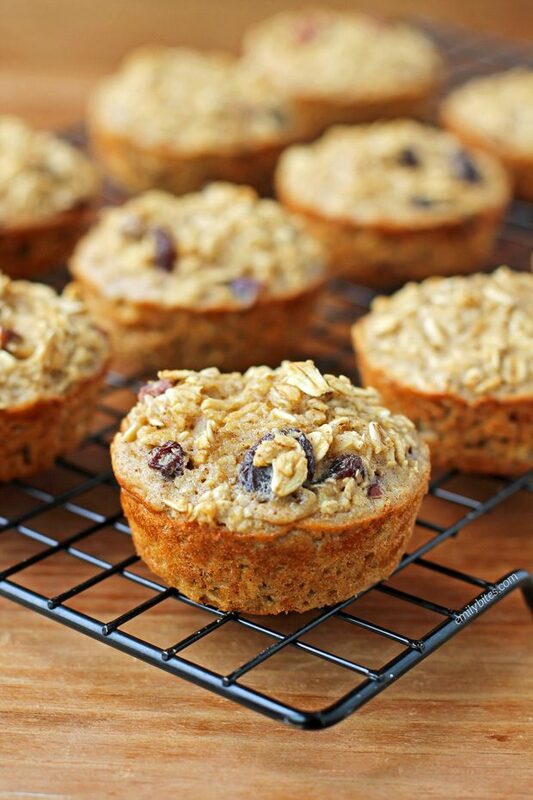 Spoon the oatmeal mixture evenly between the prepared muffin cups. Bake uncovered for 20-24 minutes or until oatmeal is lightly browned and a toothpick inserted into the middle comes out clean. Love your recipes. Any chance of adding the ingredients in ounces or grams for those of us not in USA please? These look wonderful. Could be made GF,DF very easy also. Can’t wait to try this version, the banana chocolate chip oatmeal singles are a staple in our house! One change I make you your baked oatmeal recipes that you might like-I whirl half of the oatmeal in a bullet blender to make oatmeal flour, so they are more of a cross between the baked oatmeal and a muffin. This was because my daughter doesn’t like oatmeal but I loved your recipe. Thanks for all your great and healthy ideas! These were so good- taste just like oatmeal raisin cookies to me. My new favorite, replacing the orange cranberry flavor!! I made these yesterday. They were very good. So easy. I took my great granddaughter’s kindergarten teacher one and now she wants the recipe. These are GF using GF oatmeal. I made these this weekend for my extended family and everyone loved them. They’re not too sweet. I ran out of raisins, so I used dates for the second batch and those were good, too. Thanks for the recipe. How long will these keep in a container? Do they freeze well? I love these! I may have gone a bit crazy today- I made the Oatmeal Raisin, Pumpkin Chocolate Chip & Carrot Cake ones! They are wonderful! Thank you! I’m so glad!! Haha. Which ones were your favorite? Is there something I could substitute the brown sugar with? 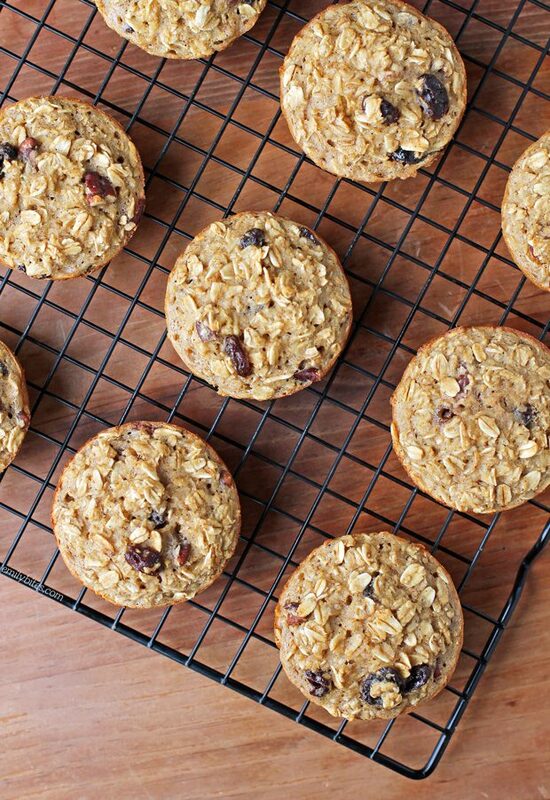 Hi Emily, I just discovered your blog and can’t wait to make these Oatmeal Raisin Baked Oatmeal Singles! I love oatmeal anything, and now I can have a healthy snack instead of boxed oatmeal bars which are loaded with preservatives. I’m also looking forward to trying more of your recipes, the sound delicious! Can this recipe be adjusted to use 2 eggs instead of 1 egg & 1 egg white? Are the oats quick oats or rolled oats? Old fashioned oats! I believe they’re also called rolled oats, though I always see them as old fashioned. Not the quick kind!